Does Bryan Mills save the day during the second season of the Taken TV show on NBC? As we all know, the Nielsen ratings typically play a big role in determining whether a TV show like Taken is cancelled or renewed for season three. Unfortunately, most of us do not live in Nielsen households. Because many viewers feel frustration when their viewing habits and opinions aren’t considered, we’d like to offer you the chance to rate all of the Taken season two episodes here. An NBC action drama, Taken stars Clive Standen as a young, but still lethal Bryan Mills. 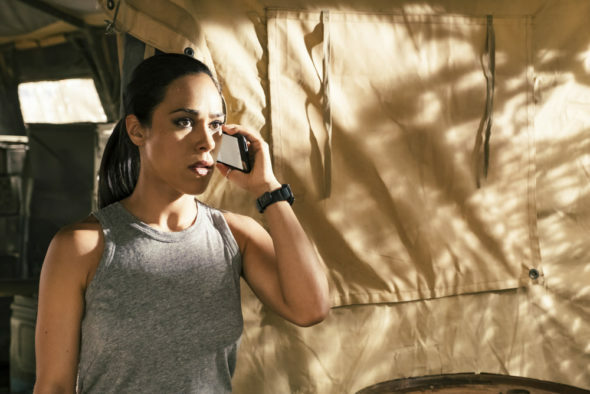 The cast also includes Jennifer Beals, Adam Goldberg, and Jessica Camacho. This prequel series to the Liam Neeson feature film trilogy centers on Mills, as he and his team undertake rescue missions around the globe. What do you think? Which season two episodes of the Taken TV series do you rate as wonderful, terrible, or somewhere between? Should NBC cancel or renew Taken for a third season? Don’t forget to vote, and share your thoughts, below. More about: Taken, Taken: canceled or renewed? Excellent Show. Riveting story lines and great acting ensemble. Please KEEP this show on air. Fantasy and really good drama shows and sticking us with stupid Reality TV/Game Shows/Housewives/The Idol/The Voice type shows>???? I would rather watch something I know can never happen to me and lose myself in a good story. I think it’s because the Reality stars don’t get paid as much as real actors/actresses get paid or you are just plain dumb when it comes to what we love to watch! Please don’t cancel. Love this show!! I am not part of the Nielsen ratings!!!! It’s unfortunate that this show has been cancelled. After more than half the actors refusing to return after one season, I think the show was able to really rebound. I enjoyed the chemistry of the actors and looked forward to each weeks new challenges. Please re-think your decision as this show should be a KEEPER. it’s one of the better shows on NBC. Please renew this program. It’s a real shame if you don’t. taken is one of the best shows. i cannot believe that season 3 is cancelled. this is a big loss to NBC viewers. I just love Taken the series it’s the best show on TV. I hope you don’t cancel this series. I love Taken the series it’s the best show on TV. I hope you don’t cancel this series. I hope you continue Taken because I absolutely love this show. We love Taken, so I hope you keep it going!!!!!!!!!!!!!!!!!!!!!!!!! It’s a great show with out all the blood and guts!!!!!! Great show good cast and storyline. It is worth renewing for a few seasons. This one of the best shows on television. Please do not cancel it. There are so few good shows anymore but this is at the top of the list of good ones! !